More than 800 people were arrested during the 2016 Dakota Access Pipeline protests. However, Native Americans are receiving the longest prison sentences. Three of the protestors with the lengthiest prison sentences have accepted plea deals due to the likelihood of unfair trials. 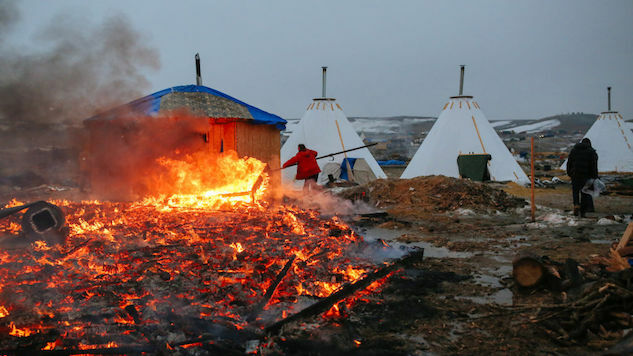 As if the entire Standing Rock incident wasn’t racist enough, the government is now giving more serious charges to the Native American protestors. Its been over two years since the protests and the building of the Dakota Access Pipeline just half a mile from Sioux tribal land, but federal judges are just now handing down charges. Red Fawn Fallis, a 39-year-old Oglala Sioux woman, has been handed the lengthiest prison sentence after being charged with one count of civil disorder, and one count of possession of firearm and ammunition by a felon. The incident occurred in October of 2016 when Fallis was protesting the building of the pipeline and law enforcement officers tackled her. As she fell to the ground and struggled as officers attempted to handcuff her, three gunshots allegedly went off and no one was injured. Officers removed a gun from her hand and arrested her. However, the .38 revolver that Fallis was holding didn’t belong to her—the gun’s legal owner was paid FBI informant Heath Harmon. Harmon was a member of the Fort Berthold Reservation and had been staying at DAPL protest camps for two months, reportedly looking for evidence of “bomb-making material.” During that time, Harmon had become Fallis’ romantic partner. During Fallis’ trial, her attorneys argued that she was “seized without probable cause while engaging in free speech protected by the First Amendment.” One of Fallis’ arresting officers reported that she was shouting, “Water is life and you’re killing Mother Earth.” The judge restricted Fallis’ lawyers from mentioning treaty rights and the prosecutors were allegedly withholding information. In the end, she took a plea deal due to the fear that she would not receive a fair trial and she now faces over four years in federal prison. The second protestor to receive a lengthy prison sentence so far is Michael “Little Feather” Giron, 45. Giron was sentenced in May to three years in prison after being charged with “civil disorder” and “use of fire to commit federal felony offenses.” On Oct. 27, 2016 protestors had set up barricades made out of logs, tires, trucks and pallets. As the police approached, they set the barricades on fire. Giron was accused of being one of the protesters who started the fires. Giron also took a plea deal in which he had to state that he aided in civil disorder in exchange for only three years in prison instead of 10-15. Michael “Rattler” Markus has also received a three-year prison sentence after taking a plea deal. He is scheduled for sentencing on Aug. 6. Mr. Erickson’s inflammatory public remarks are intended to poison local jury pools to prevent fair trials and to provide cover for his mass overcharging and false charging of arrestees, dearth of evidence, and refusal to comply with local and Constitutional requirements for producing required discovery in these cases. The thousands of Standing Rock protestors were not just Native Americans fighting for their land. But it’s the Native Americans who are facing unfair trials and are being scared into plea deals with serious prison time attached to them. Two more Native American defendants Dion Ortiz and James “Angry Bird” White are currently preparing for trials where they will likely face the same dilemma that Fallis, Giron and Markus have faced.